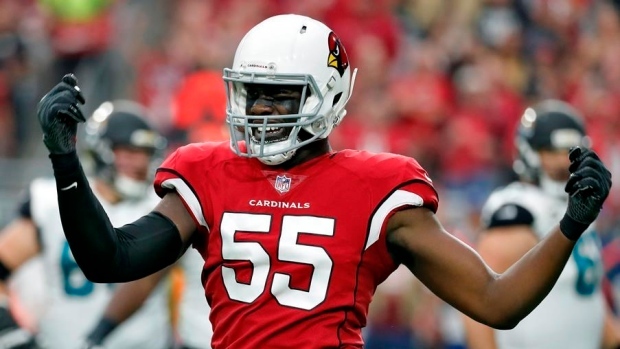 TEMPE, Ariz. — With his MMA-trained hands knocking would-be tacklers out of the way, Chandler Jones has quietly become one of the best defensive players in the NFL. The league sack leader with a franchise-record 17 last season as an outside linebacker, Jones has switched to defensive end in the team's new scheme and is harassing quarterbacks as well or better than he has in the past. Take last week's 28-18 win at San Francisco, for example. Jones had six tackles, a sack, two tackles for loss, two quarterback hits, a forced fumble, a fumble recovery and a pass swatted down (preventing a two-point conversion). He was named NFC defensive player of the week for his performance. "The standard that he put on tape this past week is what the standard is," defensive co-ordinator Al Holcomb said. "That's the expectation level for him. And we talk about that each and every day, being at his best on game day, coming to play and impacting the game because he can wreck a game." "I wouldn't say this is my best football," Jones said. "A lot of people might say that, but there were a lot of plays on Sunday that I left out there. I wish I could get them back. But that's the thing about football, you have the opportunity to correct those mistakes." "You're always getting double-teamed, being a pass rusher," he said. "You just have to be aware." In the off-season, Jones trains with his brother, MMA fighter Jon "Bones" Jones. It's helped in his endurance, Jones said, and "pretty much hand speed." "When you play the sport of football, whoever has the faster hands wins," he said. It "picks up the other 10 men in the huddle," Holcomb said. "And they're trying to match his intensity and his play and his production." The Cardinals sent guard Jonathan Cooper and a second-round pick to acquire Jones in 2016. A year later, Arizona signed Jones to a five-year, $83 million contract with $53 million guaranteed. He's lived up to that kind of paycheque. "He's one of the premier defensive ends in the National Football League," Holcomb said. "He goes about his business in a quiet-type fashion, which is fine. If he continues to play like this, which we're counting on him doing, the recognition will come." Jones said the accolades don't mean much. "I get that question all the time about not getting national recognition," he said. "My biggest thing each and every season, even when I was back in New England, is just earning the respect and the trust from my peers, my co-workers, this locker room, the coaches, the training staff, everyone around here. I feel if I can get trust from those guys I have those guys telling me 'You're doing a good job' then I'm happy."